Say hello to the new way to experience the latest Korean trends! I feel honored to have been selected as one of the first few Beta Testers of Althea Philippines. Althea is basically a website that sells Korean beauty products at Korean prices and ships to the Philippines. 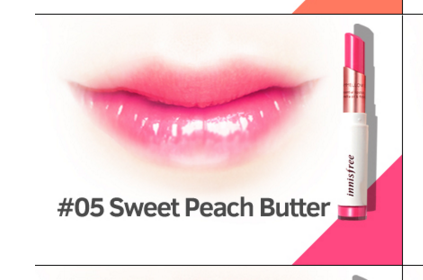 It sells brands such as The Saem, Too Cool for School, innisfree, Laneige, Holika Holika, and many others. A lot of these brands I mentioned are already doing business here in the Philippines, so what's the difference? 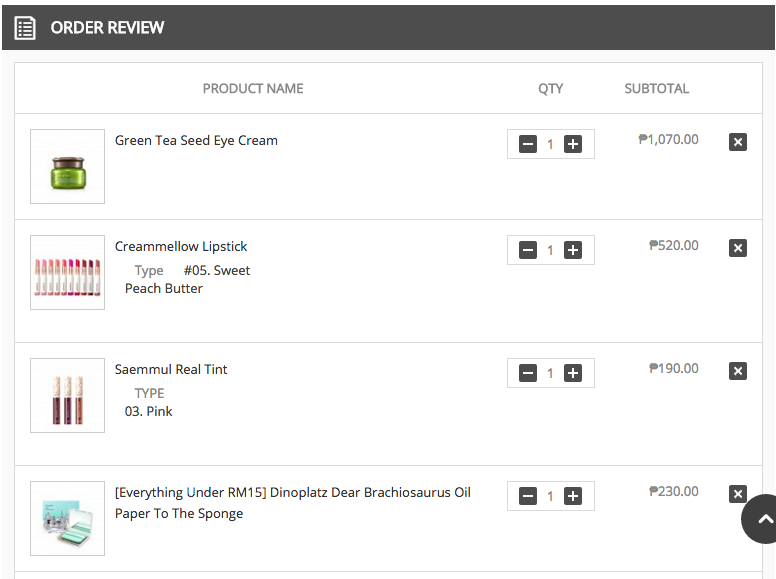 For one, in general, I like all these Korean service sites because I can get more than one brand at a time and I can already get all the items that I need from brands which may or may not be in the Philippines at the time. Another is that after I did my shopping, I realized how there are a lot of discounts and offers that you otherwise will not get if you buy the product here. Or the list price in itself is already cheaper than most places. 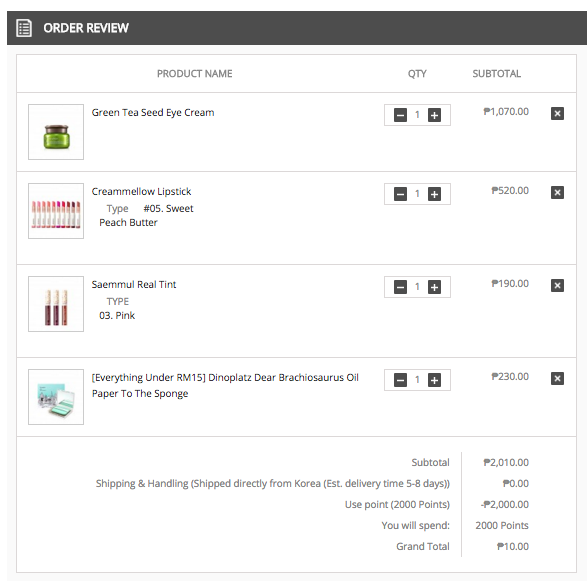 It's also a great way to try up and coming or newer brands in Korea, which may not be big enough for franchising here in the Philippines but otherwise have good products/ This is not my first time to shop at a Korean beauty website, and I don't see myself stopping in the near future because of the good deals and limited edition items. So here is my experience. The website has a typical shopping format. You see products in grids or lists, and the products are categorized under skincare, makeup, cleanser, pack and mask, new arrivals, and trendy items. So yeah let's skip to the good part and let me show you my shopping cart. For this haul, I had Php2000, which is already a very good budget if you are looking to buy just Korean makeup or masks (you can get at least 10 tint tubes and 10 mask sheets if you have Php2000 hahaha). My goal, though, was to get eye cream because this is what I feel is what is lacking in my skincare portfolio. I enumerated all the typical skincare products that exist in life, from cleanser, toner, essence, emulsion, and face cream, and remembered that for each product type I have at least one product already. I only have one eye cream right now (from SK-II) though, and having had a depressed under eye area for years now, I felt a compelling need to do something about it. 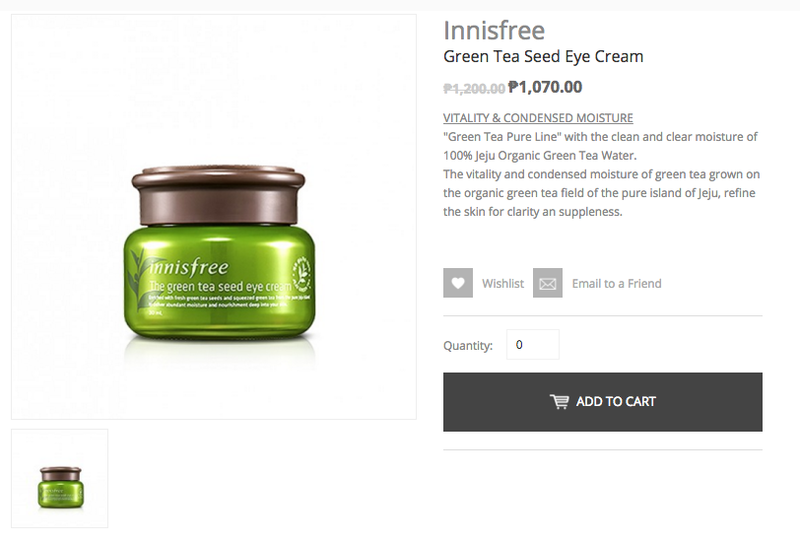 So that is the long explanation behind the innisfree eye cream in the cart. 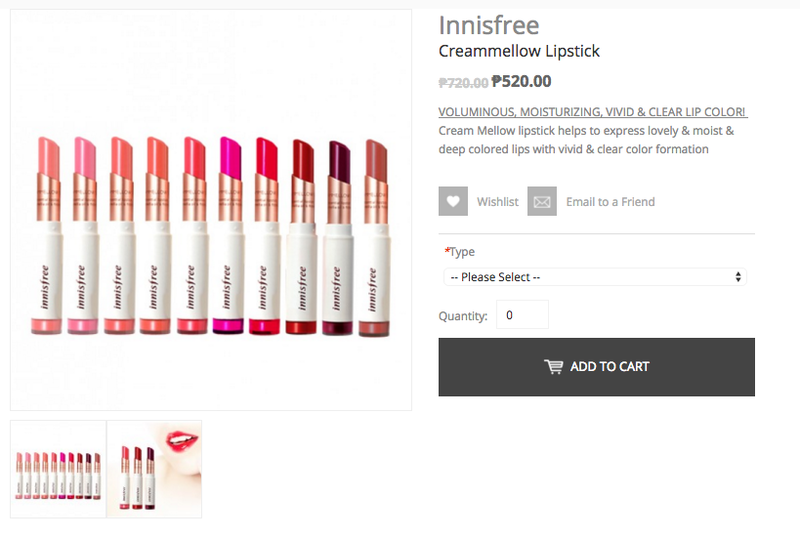 Their price is Php1070, which I think is somewhere there as it's more or less Php1000++ in Hong Kong, too. 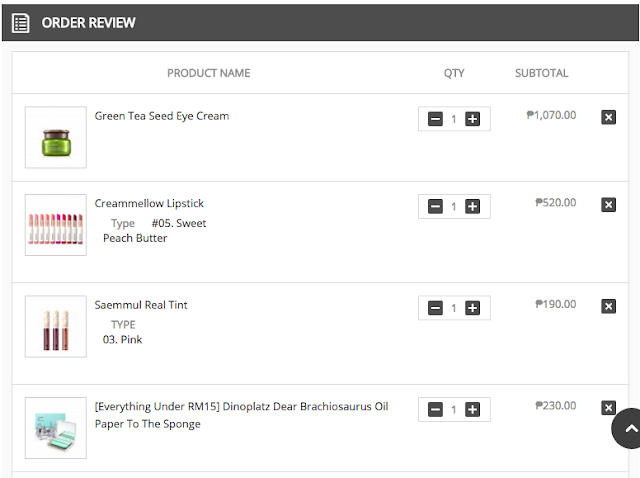 The next item on the list is from the Saem. I decided to get a tube of Saemmul real tint. I currently have tints from Tony Moly, Etude House, and bench. 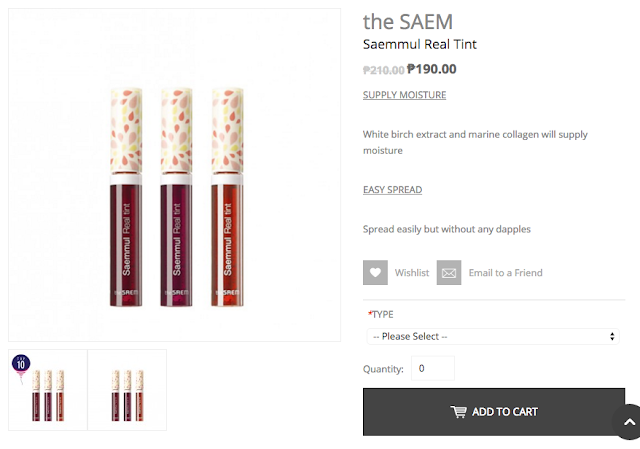 And I wanted to try tint from another brand. I got the pinkish tube of this. I'm not into orange tint (I was never an orange girl), and my other tints are already reddish toned. So that was what went into the decision. 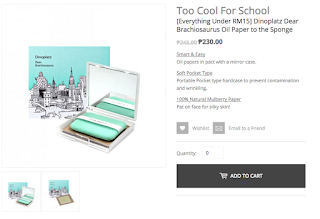 The last thing I got is this Too Cool for School Dinoplatz Dear Brachiosaurus Oil Paper to the Sponge. Boy that was a mouthful. I got this because I have been hearing people rave about it on Get It Beauty for the longest time. It's got oil blotting sheets with a sponge that has an adhesive surface. You can then get the blotting sheets to stick onto the square sponge so that you can get more mileage off the sheet (instead of the sheet just crumbling if you use your fingers). Korean experts recommend against synthetic materials (yes they're talking to you, plastic sheets) and are in favor of using natural papers. But of course, natural papers cannot be 'tugged' across the face as it will tear up immediately. So this is Korea's answer to their own problem. I personally got it simply because I feel that it's a hardworking product. I can use the mirror and the sponge even after I use up all the sheets, and I can use the case to dispense other makeup, maybe, or other small items. So yeah, all those items cost Php2010. This is the checkout page. They have a one step checkout, which is the usual when it comes to these sites. I like that they were honest about the orders coming in slower due to the Chinese New Year. The Php2000 was free, and I paid for the Php10 balance using Paypal. Once it formally launches, though, I have yet to see if they will allow bank deposit, COD, and other modes of payment. They have an order review segment, as is usual, to make you review your items. After you finish your order, they will then provide you with a transaction number, and they followed up with emails regarding the transaction. This is the email I received. I will get back to you guys when the items come. I have no idea if I have to go to the post office for this, which is why this really is just Part 1 of the whole experience.